This has been on amazingly fun week of ice cream-related treats! 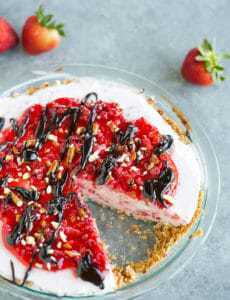 The banana split ice cream cake was definitely a highlight of the summer so far, and I’ve thoroughly enjoyed trying my hand at a lot of different homemade ice cream toppings. 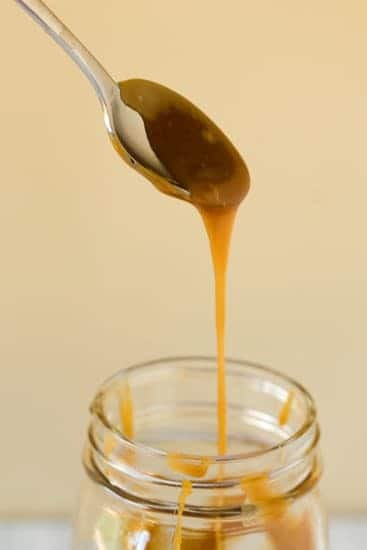 To close out the week, I’m sharing with you an absolutely fantastic recipe for butterscotch sauce. 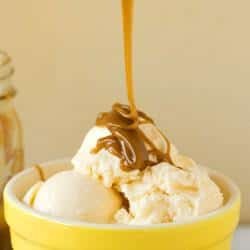 Given my love of peanut butter and hot fudge, butterscotch has never been one of my go-to flavors when it comes to ice cream and sundaes, but I do enjoy it on occasion. As I’ve found out as I tackle more and more DIY food projects, my appreciation for a lot of things has grown immensely when I make it myself. Not only is there the satisfaction in making it from scratch, but the flavor just can’t compare to anything you get from a bottle or jar at the store. 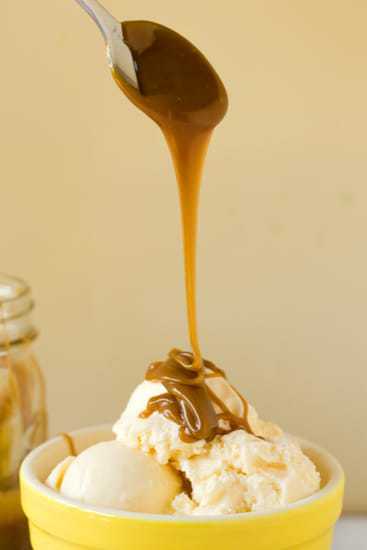 Butterscotch is definitely one of those instances – I could easily see this sauce taking up a permanent residence in my ice cream sundae rotation. It’s thick, rich and full of warm, buttery flavor. It basically tastes like the world’s best Werther’s Original (in liquid form, of course). I’ve always thought that caramel and butterscotch were very similar, but after making both I can appreciate the differences between them. 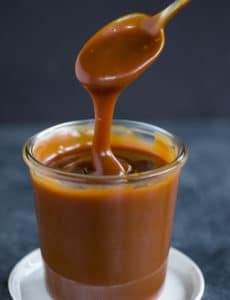 While caramel is made from melting down and cooking granulated sugar until just before it burns then adding cream and a small amount of butter, a butterscotch sauce is made by gently boiling together butter and brown sugar along with cream. There is a definite difference in flavor – the butterscotch is much sweeter thanks to the brown sugar and has that melt-in-your-mouth quality that can only be derived by a healthy dose of butter. I love that I have so many ice cream options now; I feel like an ice cream sundae party with a toppings bar is in order! What are some of your favorite toppings? I still need to tackle peanut butter; are there any others you’d like to see? Melt the butter in a medium-sized saucepan over medium heat. Add the sugar, cream and salt, and whisk until well blended. Bring to a boil then reduce the heat slightly and gently boil for 5 minutes. Remove from the heat and whisk in the vanilla extract. Serve warm or at room temperature (the sauce will thicken as it cools). Store in an airtight container in the refrigerator and re-warm before using. I made this recipe for a party at a friend’s house who was serving Ice Cream for dessert. Now everyone asks for it whenever I come to a party ~ did you make Butterscotch Sauce? This is wonderful stuff and well worth the very little effort & time it takes to make it! Thanks! Noticed majority of comments were that recipe looked delish and that commenter wanted to make it. I made the sauce and want to say that the one teaspoon of salt is way too much, especially if you are using salted butter, which I did. I would try just a small sprinkle of salt before adding anymore because I’ve got a batch of sauce that is way too salty. Made this yesterday for my best friend as a cupcake drizzle for her Birthday as she Loves Butterscotch. Well I’m 31 and have never had homemade so was not sure of what to expect and neither did my bestie as she has only had store bought also. Should you be stirring after you reduce the heat and let it boil for five minutes? And can this be jarred and reheated or should it all be used at once? Hi Lisa, No, you should not stir while it gently boils for 5 minutes. It can be jarred and reheated. Just made this…love it. I didn’t have the flake salt so used kosher, it’s a little saltier than the butterscotch sauces I’ve had but I love salted carmal so it’s all good. Giving this to my dad for Father’s Day…he loves butterscotch. 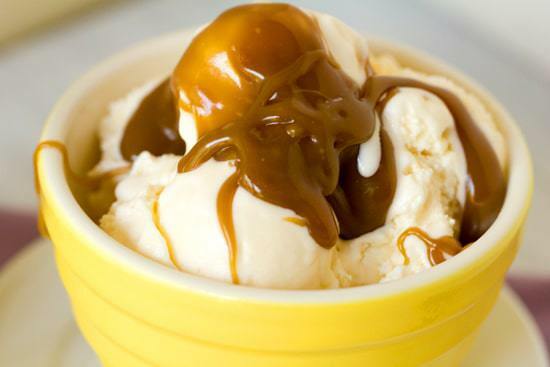 How do I keep the warm butterscotch from hardening when I pour it over ice cream? In other words, is there something I can add to keep it runny? Is that what light corn syrup’s for? Hi Victoria, This didn’t harden on me, but I know what you mean – some sauces do stiffen up once they hit the cold ice cream. I’m not sure if corn syrup would help, as I’ve tried some other sauces with that in it, and they have hardened. Maybe I just cooked it for too long. Good to know that yours didn’t harden, so I’ll keep trying. Thanks! Hi Michelle, do you think I could cut this recipe in half? And, how long does it last in fridge? Same with hot fudge… Thanks! Hi Noreen, Yes, you could definitely cut this in half. You can keep it (and the hot fudge) for up to 2 or 3 weeks. Enjoy! One question. I don’t have any fleur de sel in the house. 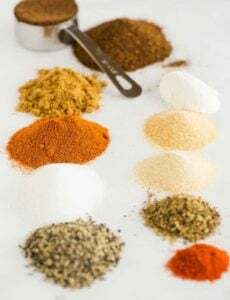 Is it okay to substitute regular table salt? I assume much less would be needed in that case? What do you think? Hi Kate, You could add a very small pinch of table salt. Enjoy! Made this last night for our upcoming Ice Cream Party. Ridiculously easy to make and oh. so. good.